It clears the cluttering – Lack of storage option in the kitchen is one of the main problems that lead to cluttering. There are various types of kitchen islands available in terms of designs, sizes, and features. Opt for that type of island that provides more storage options like cabinets, drawers, shelves, pull-outs, trays, or hooks for hanging, waste basket etc. You can keep your various types of kitchen articles on them in a neat way. You can hang kitchen towel, pans or place your cookbooks etc. Decluttering also helps in providing your more space and you can work comfortably. Small seating – It is also used as a small eating counter space or like a breakfast spot to enjoy your breakfast or can be used as an informal dining area as well. Just add a couple of small chairs or stools with it and your small seating area is ready. For a practical eating island, there should have open space under the top where your knees can tuck comfortably. It is one of the great kitchen design ideas. Extra space – It also offers extra counter space for preparation. 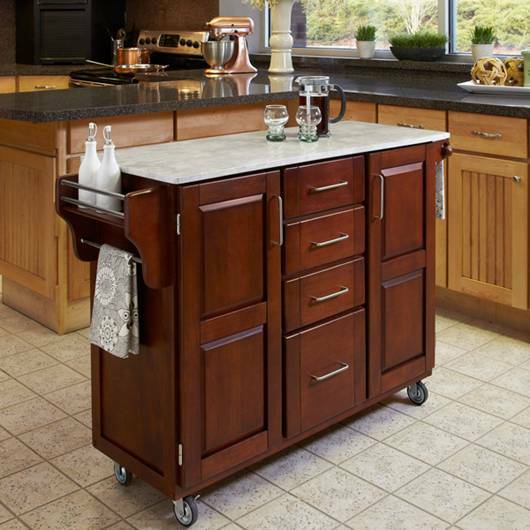 Besides the countertop, you are allowed to work freely on your kitchen island without any hassle. It caters accessible counter space for working from all the directions. If it is a floating island so it is more beneficial as a prep space as you can take it anywhere you need and work comfortably. There you have the major benefits of Kitchen Island. For any type of designing or Home decor related information, you can try Home decor online platform for it and don’t be afraid to seek the help from the professionals as well.